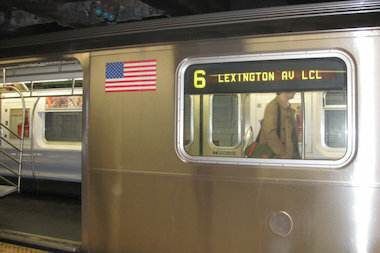 A man was riding atop a 6 train through Soundview when he hit his head and died, police said. THE BRONX — A 45-year-old man was killed Wednesday night as he was riding atop a 6 train in Soundview and his head hit a piece of overhanging subway infrastructure, police said. The subway surfer, whose name was not immediately released, was riding north on a stretch of elevated track from the Whitlock Avenue station to the Elder Avenue station, near Westchester Avenue, when he struck the solid object about 10:15 p.m., an NYPD spokesman said. He suffered severe head trauma and was pronounced dead at the scene, officials said. Witnesses said the man had been walking between cars and then climbed up onto the roof of the train where his head slammed into a hard object, police said. It was not immediately clear what he ran into, but a police spokesman said it was likely a metal support beam or another piece of equipment. Another 45-year-old man who went by the name "Grump" died similarly in October when he climbed up from between two subway cars as the train entered the station only to hit his head on a steel beam. "Subway surfing is simply one of the dumbest things you can do," MTA spokesman Kevin Ortiz said Thursday. "Don't do it."